Most people avoid failing with a vengeance. If something seems like it won’t work or if failure is even a possibility; stopping seems like the best choice. After all, who wants to fail? I embrace failure with open arms. 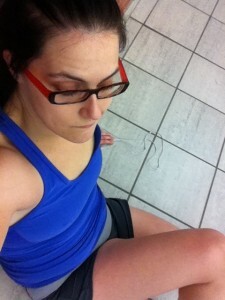 Superseting squats and wall sits results in a nearly dead Donloree flopping on the floor of the YMCA like a dead fish. Failure is the starting point for winning. In the weight room if you don’t push your muscles to failure, they never get the signal that they need to be stronger. The greatest gains come from the greatest failures. Collapsing on the gym floor gives you the opportunity to stand up and come back stronger than before. Growing your self esteem, positive attitude, discipline, focus, and ability to live on purpose takes failure. I can’t tell you the amount of times I have found myself gasping for breath on the gym floor of life while trying to see what is great about myself, possible, or just around the corner. Pushing yourself past what you know you can do results in doing more than you ever thought you could do. Never, ever stop failing because the day you stop failing is the day you stop growing.